SCOUTS-L is the "International Electronic Roundtable that Never Ends". It provides opportunities for adult youth program leaders world-wide to interact, compare notes on their programs, discuss organizational problems and concerns, and communicate with other youth program leaders all over the world! The list has been operating continuously since March 29, 1990. While the discussion may be heavily weighted towards the programs of the Boy Scouts of America (BSA), we do welcome discussions from members of the Girl Scouts of the USA (GSUSA), the World Organization of the Scout Movement (WOSM), the World Association of Girl Guides and Girl Scouts (WAGGGS), Boys' and Girls' Clubs, Campfire, and other world-wide scouting and youth organizations, and others interested in youth programs. What DO we talk about on Scouts-L? For more on this topic, see the portion of the "Welcome" letter with this heading: What do we talk about on Scouts-L?. What DON'T we talk about on Scouts-L? As you can imagine, not everyone on Scouts-L is in total agreement every day with all issues and resolutions of issues. We do argue, we express ourselves with deep personal emotion, but we also remember that we are in the company of fellow Scouters - .people who understand that disagreements are a part of being human; that the disagreement is with the other point of view, and NOT the other person. Therefore, you will NOT find here the outlandish language and ongoing discussions about topics that have no real answer to them. We don't have time for such nonsense...we're too busy discussing issues that CAN be resolved. GOD - discussion which focuses on the role of religion as a part of a youth program and how organizations use faith to either encourage or suppress particular faiths' or religious ideology involvement within elements of their youth program.. In particular, we do not permit discussions of the BSA's policy which does not allow membership of avowed atheists. GAYS - discussion which focuses on the participation, encouragement or discouragement of individuals self-identified or broadly brushed as "gays", which encompasses homosexual or bisexual lifestyles, as full or associate members of a youth program whether as volunteers, employees or youth members. In particular, we do not permit discussions of the BSA's policy which does not allow membership of leaders who are openly homosexual and/or advocate homosexual behavior, nor BSA's policy which permits homosexual youth members. We also do not permit posts which are partisan political statements, and ask that you refrain from posting other items which are not germane to the purpose of the list. You are welcome to post information pertaining to a youth program's announcement with regard to these three topic areas (or any other); however the list will be monitored to insure that follow-up emails pertain to the INFORMATION PROVIDED, and not personal or organizational "slants" one way or another. If you desire to communicate your feelings, opinions, or comments, please do so "off-list", addressing your email to the originator of the information and NOT to the entire list. We try as hard as we can NOT to censure or ignore ANYONE's point of view or thought on ANY topic, but we have "driven some topics deeply into the ground." Please check the logs *before* bringing up a sensitive topic that we have talked about before. Also, please think before replying to a issue which "may set off firerockets." If you have any concerns, please let one of the list administrators know or send a copy of your proposed posting to one of the administrators BEFORE you post it to the list. You are welcome to post youth program-related items with permission or attribution from the originator. We urge you to post the article instead of a link when at all possible since some participants are very leery to click through to linked content. Please understand that while you have a personal right to express your own viewpoints, opinions and ideas; that as a discussion group, the moderation team does have the right to request that such conversation be taken to personal emails between individuals (what we call "off-list") and NOT to the entire email list. We would also appreciate it greatly if you sign your name (not a pseudonym) somewhere in every posting so that replies can be "personalized" to you. This also makes it nicer for you to be recognized as an individual. 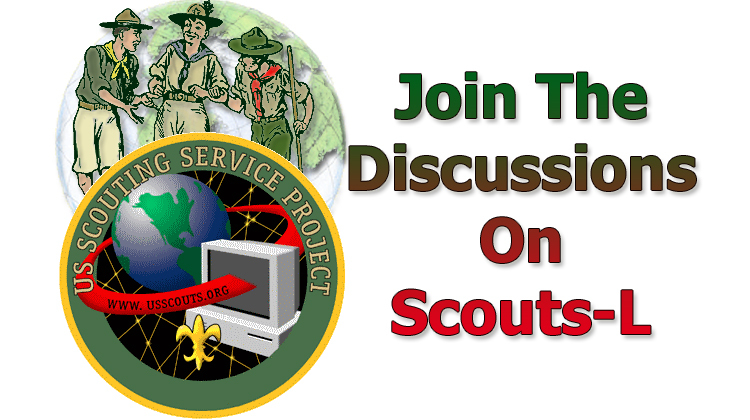 The Scouts-L electronic mailing list is operated by the US Scouting Service Project, Inc. (USSSP), an independent not-for-profit corporation organized by volunteers, whose mission is to provide web content to aid Scouts and Scouters. Scouts-L and the USSSP are not directed nor financed by any other national or local youth program organization. In particular, there is no connection to the Boy Scouts of America nor to the Girl Scouts of the USA, and Scouts-L should not be considered as a marketing or program element of any national youth program organization. For information on how to Subscribe to the list, Click Here. The Listserv is a computer program that accepts and processes commands or inquiries. THERE IS NOBODY PHYSICALLY AT THE LISTSERV ADDRESS! LISTSERV@SCOUTS-L.COM Use this when you want to send a command to the server, such as to subscribe, unsubscribe, get log files, or change options. A good command to start with is "HELP". For information on a number of other useful commands which can be sent to LISTSERV, Click Here. If you need to change your e-mail address or unsubscribe, and you no longer have access to the account by which you joined, contact on of the administrators to have the account deleted or changed. When first subscribing to SCOUTS-L, please feel free to post a brief message (about a screen's worth) about yourself to introduce yourself to the list. When responding to someone's introduction, please DO NOT USE the reply function of your mailer as your reply will then also be distributed to the entire list. Use private Email. SCOUTS-L makes a concerted effort to keep network traffic and "junk mail" to a minimum, since there are many subscribers receiving SCOUTS-L through their place of work. What is archived on SCOUTS-L? When first subscribing, you may want to get the most recent log file or files so that you can "catch up" on what has been going on. Log files are also useful to see what has been discussed while you've been away from the list for a while. We hope to see SCOUTS-L continue for many years as a major resource to Scouters and others as well as a forum for which ideas can be expressed and the differences that we all have can be appreciated.